The Pilgrim Walk is a physical expression of the ACC&C's commitment to reflect the relationship between Christianity and Australian culture. 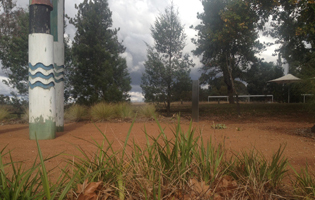 The Walk reflects the relationship between universal and local themes in the expression of Christianity in Australia. 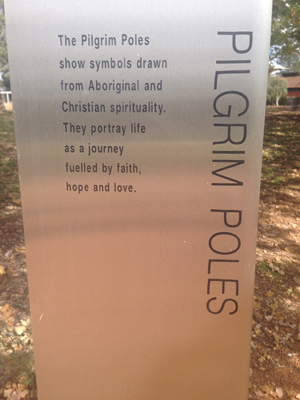 From the place of meeting, to the avenue of trees and the pilgrim poles, to the labyrinth made of Australian grasses and the Bible Garden, walkers may consider how Australian Christianity has been shaped by the particular circumstances of the landscape and the history of this land, within the context of the universal story of God's saving and redeeming love through the life and work of Jesus Christ. The Walk is inspired by the parables of the New Testament, in which examples from ordinary human life provide spiritual truth. The Pilgrim Walk provides an opportunity to reflect upon the relationship between the gospel and life experience. You can view and download a map and guide to the features of the Pilgrim Walk here. and all its people, old and new. so may your mercy enfold us all. be for us a rock of strength. keep us safe in every storm. where we may share in the very Communion of God, Father, Son and Holy Spirit.